Roybal Chiropractic offers a wide variety of Doctor Grade vitamin and nutritional supplements as well as orthopedic appliances the doctor's recommend if it will help your treatment. The 100% viscoelastic memory foam responds to body heat to betterconform to the unique shape of your head and neck. Comes with a soft, comfortable, plush fabric cover. Different sized lobes offer two levels of comfort. 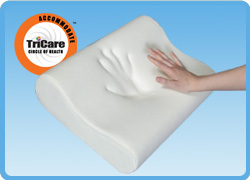 Ideal for helping relieve discomfort due to recent injuries. These gel rolls are used to offer hot or cold therapy to the cervical area while comfortably supporting the neck when in lying on your back. The tough, flexible gel will not leak if punctured and the 4-way stretch material will help ensure product durability and effective therapy and pain management. This can be put in the microwave for heating or in the freezer for cooling. Stays soft and pliable, even at -20 F. Provides 20-40 minutes of treatment per application. Available in two sizes. The exercise ball - also called a Swiss ball or physio ball - is a conservative treatment option for back pain sufferers and is designed to help prevent further episodes of low back pain as part of a rehabilitation program. The exercise ball is effective in rehabilitation of the back because it helps strengthen and develop the core body muscles that help to stabilize the spine. For over 20 years, Metagenics has been the most trusted name in professional nutritional supplements. These products are only available through licensed healthcare practitioners who understand and recognize the importance of quality nutritional formulas to help patients achieve and maintain a lifetime of good health. Metagenics are one of the few professional nutritional supplement providers that manufactures formulas in their own facility that is independently certified for Good Manufacturing Practices -the ultimate mark of quality manufacturing. They also have one of the industry's most stringent infrastructures for quality assurance and control to ensure the purity and safety of every formula-so you'll receive the health benefits you expect. Contact us to find out more! .